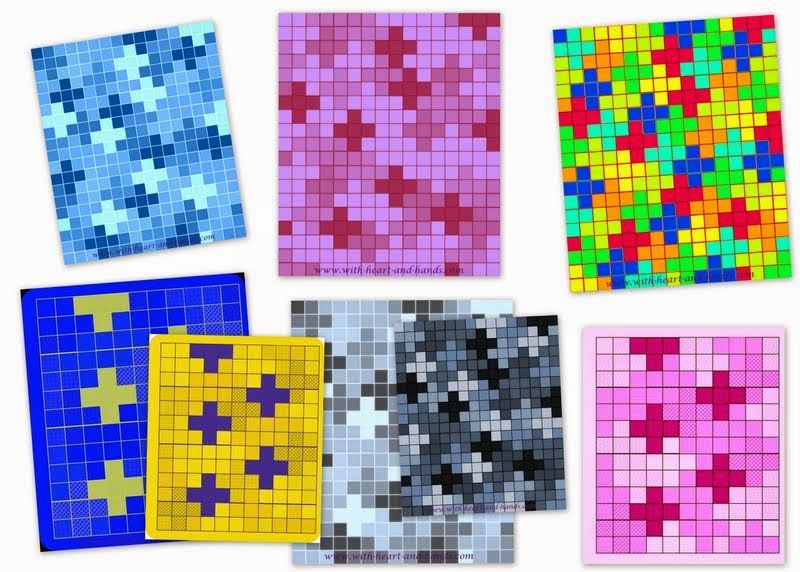 When I make simple quilts with squares or other nine patch designs, I often send forth the intention of their manifestation as prayer quilts. To me, a prayer quilt is simply a quilt in which you tie, rather than quilt, the three layers of the quilt fabric, together. Tying each double, or even triple knot, gives you the opportunity to direct with the caring power and simple thoughts of blessing, directly from your heart, through your hands, and out into the heart of the person who will receive it. 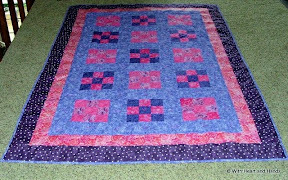 The hope is that the person who ends up receiving the quilt...in a nursing home or perhaps, even in hospice, will end up receiving not only a colorful quilt.... but lots and lots of blessings. It doesn't matter if the quilt pattern is simple or complex, but the simpler you keep them, the faster you can make them! I like to make mine lap sized or a little bigger. This one is 52" x 75" and could be used for a wheelchair or on a cot. And as I love sending forth many quilts into the universe, I love making ones that can be made in a few days or a week's time, so many can be made and given. Here, I was given some blocks and all of the strips, borders, and backing fabric by someone who didn't like how 'loud' it was. Well, when it comes to the need for healing energies or blessings or prayer...energizing with color can be a very good thing! And when it comes to how we think of color, pink is a powerful healing color and often used to symbolize hope, and purple is a strong spiritual color and often used for the energies of remembrance. So, I named this quilt "Hope and Remembrance." And if you want to truly make it personal, or you belong to a church or other charitable quilting group...add a little pocket to the back and tuck in a special note or prayer of healing thoughts of your own. In any case, it is a gift that will be treasured, not only by the recipient, but by their extended family...just knowing that someone out there who didn't even know them..... still cared enough to make them a quilt. What a lovely and thoughtful idea! I often sign the quilts I make with an embroidered message "With Love in Every Stitch." That quilt is beautiful and I really appreciate that you do so much for others. Giving of yourself is such a wonderful thing and I know many have been blessed by your hands...which are an extension of His. It is beautiful - I think the purple and the pink are just gorgeous. I'm adding a prayer that it heals and comforts the recipient.